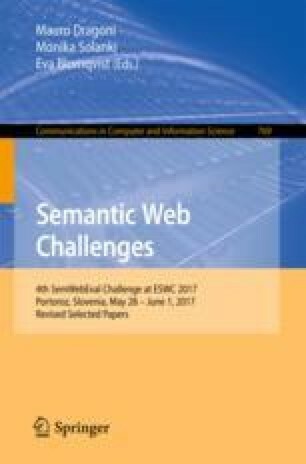 In this paper we present a knowledge base question answering system for participation in Task 4 of the QALD-7 shared task. Our system is an end-to-end neural architecture for constructing a structural semantic representation of a natural language question. We define semantic representations as graphs that are generated step-wise and can be translated into knowledge base queries to retrieve answers. We use a convolutional neural network (CNN) model to learn vector encodings for the questions and the semantic graphs and use it to select the best matching graph for the input question. We show on two different datasets that our system is able to successfully generalize to new data. We thank the anonymous reviewers for their valuable comments and insights that helped us to improve upon the initial version of the paper. This work has been supported by the German Research Foundation as part of the QA-EduInf project (grant GU 798/18-1 and grant RI 803/12-1). We gratefully acknowledge the support of NVIDIA Corporation with the donation of the Tesla K40 GPU used for this research.